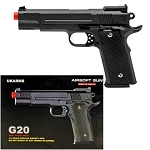 Size, strength and power is exactly what you can expect with the Spring G12 Regulator 6mm Pistol Airsoft Gun! 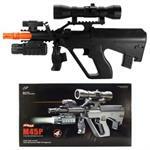 This great Airsoft Gun is perfect for anyone who is looking for a small light weight gun that packs a big punch! The G12 Regulator has metal and plastic construction and is 6.5 Inches long making this gun small and durable! With 2 magazines one single shot and one with a capacity of 10 RDs this airsoft gun is able to unload its magazine at speeds 215 FPS! This is a Spring Airsoft Pistol, which means it's powered by a spring and must be cocked for each shot. It's fast, clean, inexpensive and easily maintained; it requires no gas or batteries to operate.